"… Jonathan Haas -- the world's foremost solo timpanist and a passionate flag-bearer for the timpani's solo potential..."
"Jonathan Haas, the soloist, gave a virtuosic performance on all manner of bells, blocks, canisters (metal and wood), gongs, drums and cymbals (some suspended directly over his head) as well as a kettledrum said to be the largest in the world…"
"Wherever one finds a percussion instrument waiting to be struck or strummed, [Haas] is probably nearby... with consummate expertise." "The only solo virtuoso timpanist around, the superstar of the timpani." "[Jonathan Haas is] the Paganini of the timpani." "It is not hard to be entertained by the sheer theatricality of imaginative [drummer] Jonathan Haas… in a virtuoso display…"
"Champion of the timpani, virtuoso Jonathan Haas has carried his instrument over wide musical lines, from performances with rock groups like Aerosmith and Frank Zappa to classical concertos." "People whooped and hollered after the dazzling display of timpani virtuosity by Jonathan Haas." "Jonathan Haas turns music for percussion on its ear." "Percussionist Jonathan Haas, arguably the world's greatest living timpanist…"
"Alone on stage, timpanist Jonathan Haas gave a virtuoso demonstration of various… techniques, moving seamlessly… and making the drums 'sing.'" "In Philip Glass's brash Concerto Fantasy for Two Timpanists and Orchestra, fourteen kettledrums thump away non-stop in front of a vast orchestral spread: it was so outrageously simple it had to work, and this time there was virtuosity in trumps from the soloists Jonathan Haas and John Chimes." 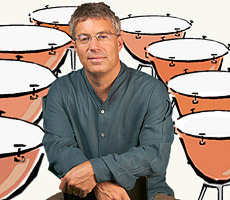 "[The Philip Glass timpani concerto] should continue to be a hit on orchestra programs, thanks to its ability to create a visual spectacle, but also for a number of musical reasons, such as its extraordinary use of 14 timpani along with some rapid tuning changes that make it feasible to play long and intricate melodic lines. If the critical acclaim earned thus far is any indication, this double concerto should readily find a permanent place in the repertoire." "Of Glass's Concerto Fantasy, the best summation is: Wow. It is a completely exhilarating explosion of primitive energy, zinging with cross-rhythms, repetitive patterns (of course), shifting pulses taken at breathtaking speed. The mere sight of Jonathan Haas and Svetoslav Stoyanov, magicians both, in total command of a battery of 14 polished kettle drums was dazzling enough in itself." "Jonathan Haas, the noted percussion virtuoso who asked Glass to write the concerto… brought a combination of dazzle, grace and total assurance to the demanding solo parts." "The second in this season’s classical series by the Naples Philharmonic Orchestra is titled 'Schubert’s The Great.’ And that’s exactly what the program proved itself to be — and not because of Schubert. No. Nestled in the middle of the evening’s program was an absolutely phenomenal piece by contemporary American composer Philip Glass. 'Concerto Fantasy for Two Timpanists and Orchestra' proved itself to be a blockbuster. The concerto was commissioned by guest artist Jonathan Haas, one of the evening’s two timpanists. Fourteen timpani front and center on the concert stage! The visual impact alone of the sheer mass of gleaming timpani was nearly overwhelming. This is a concerto with such great rhythm, such energy, it was virtually impossible not to head nod or toe tap. Every time I reluctantly tore my eyes away from what was unfolding on stage and sneaked a peek at the audience, that’s what any number of them were doing. I must confess I, who am not always thrilled by some of the 'new classical music' was practically whimpering in ecstasy throughout the entire performance. I didn’t want it to end. And when it was finally over — when it was impossible to believe either timpanist could add one more note before their arms fell off — the audience erupted. Cheered. Gave the orchestra and the two timpanists a standing ovation. Thus, by the time Schubert’s 'Great' began, we had already experienced the great." "… one of the most engaging, impressive and beautiful things Glass has done. The cadenza preceding the third movement, highly athletic as it is, proves to be a warm-up for Evelyn Glennie and Jonathan Haas before the technical tour de force of the finale." "Normally tucked away at the back of an orchestra, timpani comes to the fore in [Philip Glass'] Concerto Fantasy. Haas sits in a ring of seven large timpani drums… The effect, during yesterday's rehearsal in the whisper-quiet Concert Hall of the Sydney Opera House, was stunning. The first delicate blows of the timpani mallets barely cause a ripple, but it builds into a shimmer and then a thundering wall of sound." "Haas, timpani soloist extraordinaire, demonstrated masterly technique…"
Click on title below to read the full article! Interview with Jonathan Haas on "Arts Alive"